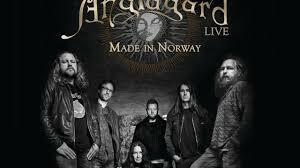 According to Anglagard‘s own discography, playing at Progfest in 1993 was one of their earliest live gigs. The young group at work had just released their first album Hybris and what you hear is a young group at work whose ambition and hunger steamrolled over their few deficiencies. This debut album and its follow up Epilog were two of the first to light a fire under what was a growing revival in the symphonic progressive rock of the 70s. However, despite their significant impact, it would be just under two decades before their third studio album was released and in that interim most of what you heard was rumors, reissues of their albums that would go quickly out of print, but no real indication that the band had hung it up permanently. From an outsider vantage point, there really was no documentation of what would have been the maturing period of a young group, and by the next live album, Prog Pa Svenska: Live in Japan, the band had replaced two key members at the keyboards and drums spot, basically causing something of a reset in the interpersonal chemistry. While that album is certainly good, after all you’re still basing it on extremely high quality compositional work, there was still no impression that everything had quite come together yet. However, since the reformation of this new group, the band has been steadily gigging and have welcomed back Jonas Engdegard to the fold, returning to the dual-guitar sextet of their youth. Anglagard is a group that is not young anymore. 20 years will do that to you. It’s more of a shift now that you can see them play together on a stage. It’s even more disconcerting watching this sextet crunched up on stage in Norway playing some of those most sonically dynamic material ever recorded in rock music to a cramped, standing-room only crowd. But mostly the experience is awe inspiring in how they’ve taken material from three albums separated in the middle by many long years and found a way of making it all consonant. Almost all of the tracks from the early years are minutes longer, such as the extended 17 ½ minute Kung Bore with an exquisitely gorgeous introduction. In fact one of the great changes that the new band brings to the material is all of the (sometimes seemingly) interstitial folky material. So many of these softer moments aren’t found in the prog rock guidebook, they’re instead almost pagan-folky, with hints of Comus or Kemiallasat Ystavat. Anna Holmgren joyfully bringing out her inner Hermeto Pascoal with variations on a balloon escaping air or a long droning melodica line over the band’s half ambient, half mid-period King Crimson soundscaping is an utter delight to watch. When Linus Kaske joins her on saxophone during the end of “Langtans Klocka” the sound goes from Lizard era-King Crimson to a full free jazz blow out without changing the parameters of their sound at all. This isn’t a young band playing this, a young band wouldn’t be able to energetically pull this off. And this is perhaps what’s so striking about a group that started their career with mostly minor-key material drenched in melancholy, that they’re having so much fun doing it at this point. There seems to be a sense that they know how powerful their oeuvre is. When they’re playing the central melodies from their classics there’s a sense of knowingness about it in that they not only have they earned it compositionally but they earn it from the way they build it up from the careful soundscaping to the peaks and back again. There isn’t a spot along the way that isn’t interesting. It’s not just mellotrons that give the sound depth, it’s also carefully crafted guitar and bass droning, all weaved in so competently that your brain jumps around from spot to spot to see who’s doing what, how they come together to create such an impressive unity. For me symphonic progressive music is most successful when it innovates without leaving behind the warm aesthetics of the 70s and Anglagard is not just checking off these boxes, they’re annihilating them completely. And I’m encouraged that there seems to be more stability in this line up than in any previous one. I’m genuinely hesitant to buy videos of groups knowing that they’ll probably sit on a shelf after a play, but this won’t be one of them, I felt like there was so much going on I want to hear it again already to see if my ears can keep up with it. I won’t say Anglagard has arrived, they did that in 1993. But whatever anticipation I have for a new studio album has definitely increased because their potential has never been higher at any point in their career. Meanwhile, the band has finally delivered a live release on par with their studio work. Source: The Progressive Aspect. I think this is a first – Magma playing with a large orchestra. The large ensemble launched into the whole of Ëmëhntëhtt-Ré with gusto and no little panache and subtlety. I recognised this one all right! After some tweaking of the mix, the sound engineers got the balance between Magma, led as ever by the magnificent drumming of the ever-youthful Christian Vander and the bass, currently supplied with grace and power by Philippe Bussonet, and the more delicate timbres of the Orkestraah just right. Occasionally conducted enthusiastically by vibes player Benoît Alziary, the orchestra, while adding many layers to the sound, made the whole inevitably more subtle and intricate than the last time I witnessed the band in the much more intimate setting of Café OTO. However, this is not at the expense of Magma’s innate force, which came to the fore on the mighty Slag Tanz. Anna Webber’s Simple Trio is reviewed and profiled. The Chicago Reader reviews and profiles the reissue of Eugene Chadbourne‘s There’ll Be No Tears Tonight. A recent video is an inside look at Abbey Rader and John McMinn creating a score for the upcoming film “Phenobarbital” by Jorge Rubiera. It features a solo session of Rader playing gongs and percussion and an improvised duet on piano and drums. Todd Anderson-Kunert – When There Is Nothing Left to Say.